Guess who’s on the cover! I’m so excited to share this! A few years back I met an incredible woman named Anne Perry, the founder of Business Heroine Magazine and the creator of Business Heroine Academy. We instantly connected over our shared journey to create a business based on or most sacred priorities, the desire to create from our heart and soul while building a thriving business. 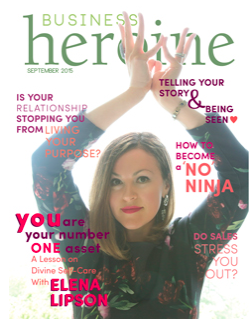 I’ve watched the cover of each monthly issue and the amazing women I admire grace the cover … Kris Carr, Denise Duffield-Thomas, Nisha Moodley and Laura Hollick .. and now ME :). It’s a total dream come true to be recognized for my work and to have a magazine cover with my image on it. It truly feels amazing to have a validation of the journey I’ve taken, the leaps I’ve taken to create something out of nothing. When I decided to become the Divine Self-Care Mentor and teach women around the world to step into their divine power and become their #1 best asset in life, business and the bedroom, I wasn’t sure where the path would lead. There are twists and turns, ups and downs, and I LOVE IT ALL!!! It’s not always easy, but my WHY is huge and drives me. I believe that well taken care of woman is capable of changing her world and the world around her … and the abundance and prosperity that gives us choices makes us rich in all areas of life and allows us to serve at our highest level and contribute in big ways. There’s a fabulous interview that goes along with the article. I invite you to sit back and listen to the interview here where I share some of the best wisdom I know to help you to create a daily practice to help you to step into your highest vision of life. Enjoy! The interview was amazing … take a break and listen now. Leave a comment or reply here and let me know what you think of the interview.